VATICAN CITY (CNS) — Christians must be courageous when praying to God and not simply repeat prayers “like a parrot,” Pope Francis said. “In common parlance, people use an expression that I really like when they have a goal: ‘I put it all on the line.’ In intercessory prayers, this also applies: ‘I put it all on the line’; it is the courage to go forward. But perhaps the doubt may arise: ‘I do this, but how do I know the Lord listens to me?’ We have a certainty: Jesus. He is the great intercessor,” the pope said in his homily April 4 during his morning Mass at Domus Sanctae Marthae. 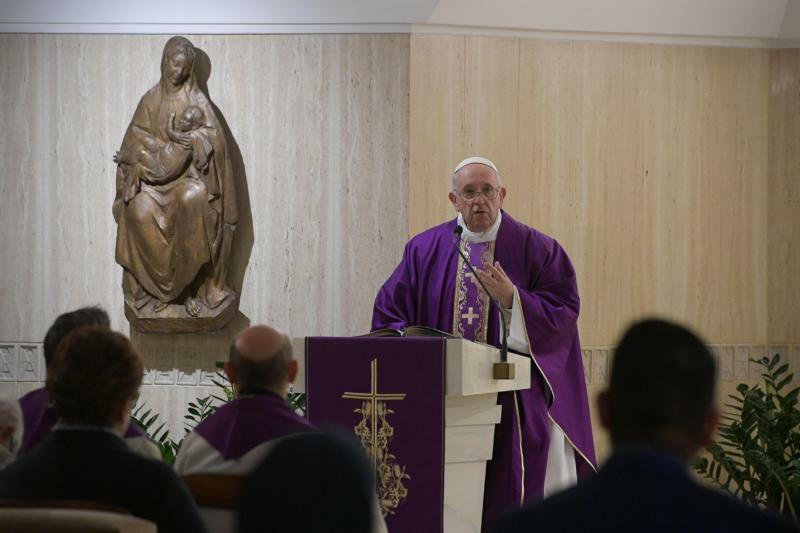 In his homily, the pope reflected on the day’s first reading from the Book of Exodus in which Moses intercedes with God on behalf of the people of Israel, who had fallen into sin. “Jesus does not need to speak before the father: he shows him his wounds. The father sees his wounds and gives us the grace,” Pope Francis said. “When we pray, let us remember that we do it with Jesus. When we do a courageous prayer of intercession, we do it with Jesus,” the pope said.